Julia is now ready to launch her first marketing effort. After sending her invitations, Julia can start send an e-mail message�or a mass mailing�to remind her targeted customers about the wine tasting. Before a big event, it's helpful to double-check you've completed all necessary preparations. Julia can spend more time with her guests during the tasting if she takes the time to verify she's taken care of last-minute details. 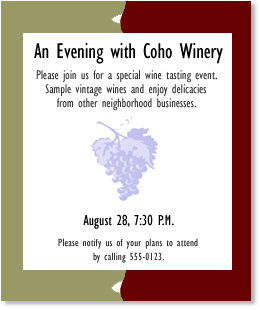 Walk through a check list that could help Julia plan her wine tasting event (28 KB Microsoft Word file*).